Marcela Marino has her mother to thank for leading her to the sport of tennis. Elena Dominguez was a highly skilled tennis player back in the day, and she used to bring her daughter, Marcela, along to her matches. When Marcela was a very young child, she was unsure what to make of the sport, but by age 8 she picked up a racquet herself and started taking lessons. It didn’t happen right away, but eventually she fell in love with it. Now, decades later, Marcela is still playing. Her mother introduced her to the sport, but she continues playing matches to this day because she enjoys it herself. Merino has played over 200 matches with Tennis League Network, and she’s found success forming friendships, winning intense battles and staying active and invigorated along the way. Merino switched from tennis to ballet when she was around 10, and after that she dabbled in softball as a kid. She’s the kind of person who likes to focus on one sport at a time, making sure she specializes enough in that craft so she can get the most out of the experience. 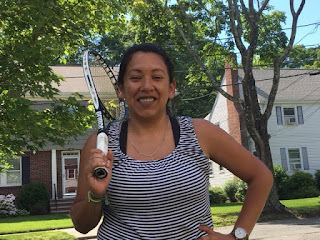 Around age 20, she picked up tennis once again, and she’s found her niche with TennisNorthEast.com the Metro Boston Tennis League a division of Tennis League Network recently. She now plays tennis exclusively, and it’s one of her favorite hobbies. Her love for the sport is the main reason she plays so much, but she also enjoys the personal side of tennis. She’s become close with Mary Heasley, a fellow veteran who has played even more matches than Marcela. All it takes is an email, and they start collaborating to zero in on a day they’re both free. In no time, they’re on the courts, hitting groundstroke after groundstroke, trying to outwit and outhit the other. “We’ve actually become very good friends,” Merino said. When it comes to her style of play, the Newton, Massachusetts resident Merino is tenacious and relentless. After over 200 matches, Her record is close to .500 overall, and she has a winning record in three-setters and third-set tiebreakers. Marcela's Career stats. She rarely gives in, and she’ll do anything it takes to get the win. Oftentimes, that means unleashing a slick slice at the exact right moment. “Everybody tells me that I have sort of a nasty slice,” she said, laughing. But that doesn’t mean there’s not room for improvement. Merino said she wants to improve her serve – both the accuracy and speed. The great thing about tennis is that she can do that by herself. Once she feels comfortable with her new technique, she can try it out against Mary or another opponent. She said she enjoys TennisNorthEast.com because it’s the right level of competitiveness. The goal is to win, but it’s also to have fun and there isn’t too much stress or pressure. She’s played dozens of matches and here's Marcela's current division, and she’s showing no signs of slowing down. She wouldn’t be the player she is without her mother, and for that she’s both proud and grateful. “My mom was very influential in getting me into the sport,” Merino said.